In this crazy world today, we are all seeking our own paths towards growth and enlightenment, but we think your journey ought to include the simple pleasures, like donuts. 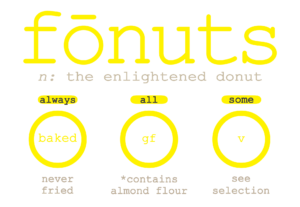 Enter the next step in the evolution of the donut: the fōnut…a delicious, guilt-free treat, baked with a healthy dose of loving kindness, that feels great to enjoy and leaves you feeling good. 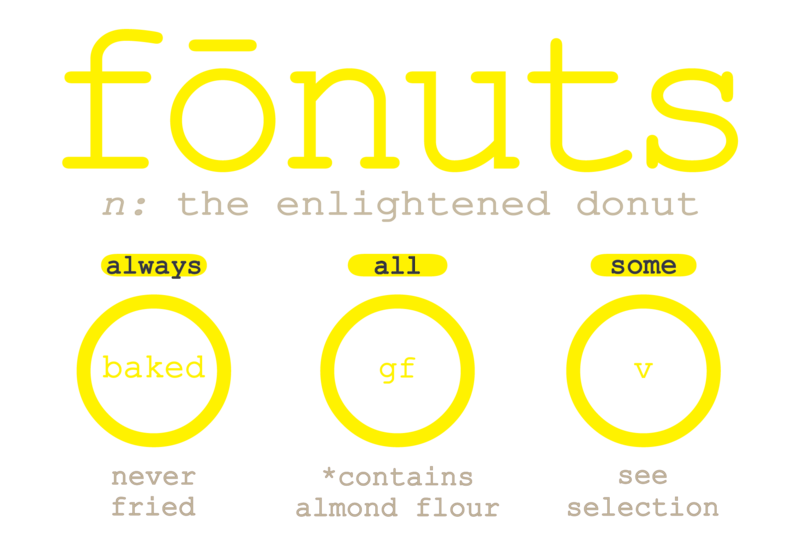 Come on in and add fōnuts to your personal path towards enlightenment. 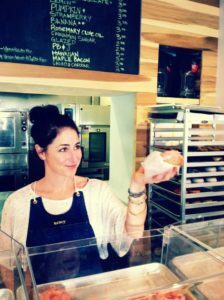 fōnuts creator Nancy Truman, along with her husband Thom Furtado have embraced this evolution and transformed all your favorite flavors to 100% gluten-free, with low-to-no sugar added, organic ingredients…while always expanding the popular seasonal and vegan flavors. Along with this transformation of recipes, Nancy and Thom have dedicated the entire business to a more enlightened path, embodying the values of kindness, creativity, and community. They consider every team member, and every fōnuts fan, as part of the fōnuts family. As the story goes, it all started with a cup of coffee, and the need for something yummy to go with it! L.A. native Nancy Truman always loved pairing her morning and, okay, afternoon, coffee with baked goods. But after discovering her own gluten intolerance, she realized how hard it was to find a quality, all-natural gluten-free treat. All the gf snacks out there were either too sweet, or had the consistency of dirt, and usually both! With acting and voice-over credits ranging from Finding Dory to Curb Your Enthusiasm, she had quite a bit of “let’s have coffee” experience, and knew many others had trouble finding a tasty solution. So, with a craving in her belly, Nancy started baking on her own. the beloved old-fashioned cake donut reinvented as a modern classic. Always baked, never fried, emphasizing simple recipes, all-natural, gluten-free ingredients, served with a healthy dose of loving kindness. 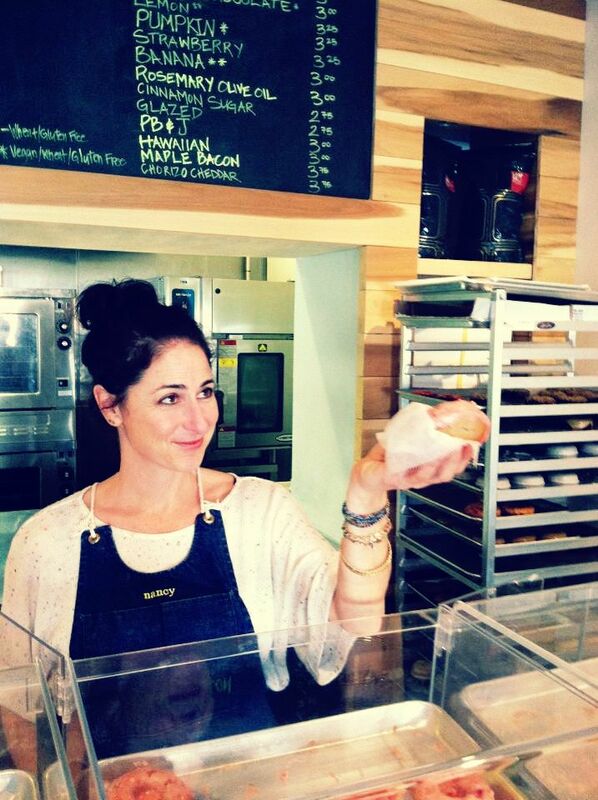 That summer, the first fōnut shop opened to critical acclaim and widespread success. Envisioned as a fresh take on the timeless donut shop experience we all grew up with, fōnuts quickly became LA’s go-to destination for anyone seeking a “better-for-you” donut. LA loved them, Nancy loved making them, and as good things come in threes, recently arrived NYC native Thom Furtado fell in love with Nancy and her fōnuts. As their love continued to grow, it only made sense for them to join Nancy’s creative genius and Thom’s design and operational experience to make fōnuts a family business. Together, Nancy and Thom are proud of what fōnuts means to the city of Los Angeles, and are even more excited about the continued evolution of fōnuts — the enlightened donut. n: a faux donut, always baked…never fried.